Sotrastaurin is a potent and selective pan-PKC inhibitor, mostly for PKCθ with Ki of 0.22 nM in a cell-free assay; inactive to PKCζ. Phase 2. Lysates from H3122 and MGH006 cells treated with 1 µM PMA in the presence or absence of 0.3 µM sotrastaurin (SOT) were fractionated. Immunoblotting was performed with the indicated antibodies. Cancer Cell, 2015, 27(3): 397-408 . Sotrastaurin purchased from Selleck. J-Lat A2 cells were stimulated by TPA (10 nM) for 24 h in the presence of the indicated concentrations of AUY922 and sotrastaurin, alone or in combination. Samples were analyzed by FACS and data plotted using MacSynergy II software. (A) Representative McSynergy II plot: areas of the graph above zero indicate an additive or synergistic effect. (B) Representative checkerboard grid used to calculate the plot shown in A.
Proc Natl Acad Sci USA, 2014, 111(15): E1528-37. Sotrastaurin purchased from Selleck. Primary mantle cell lymphoma (MCL) cells respond differentially to sotrastaurin and ibrutinib. Primary MCL cells (MCL01-MCL04) were treated with 3 μmol/l sotrastaurin or 400 nmol/l ibrutinib for 2 h (A) or 22 h (B) followed by a stimulation with 3 μg/ml anti-human IgM antibody for 10 min. Subsequently whole cell lysates were analysed by Western blotting. DMSO, dimethyl sulphoxide. Br J Haematol, 2016, 173(3):394-403. Sotrastaurin purchased from Selleck. Western blotting analysis of FLT3ePIM-1 signaling in MV4-11 cells treated with increasing concentrations of SGI-1776, quizartinib, or sotrastaurin for 24 h.
Biochem Biophys Res Commun, 2018, 10.1016/j.bbrc.2018.07.049. Sotrastaurin purchased from Selleck. Unlike former PKC inhibitors, Sotrastaurin does not enhance apoptosis of murine T-cell blasts in a model of activation-induced cell death. Evenou JP, et al. J Pharmacol Exp Ther, 2009, 330(3), 792-801. Naylor TL, et al. Cancer Res, 2011, 71(7), 2643-2653. Weckbecker G, et al. Transpl Int, 2010, 23(5), 543-552. Could you give me the information about how to prepare Sotrastaurin for oral administration in mice? S2791 Sotrastaurin can be dissolved in 2% DMSO/30% PEG 300/ddH2O at 10 mg/ml as a clear solution which can be used for injection, and in 2% DMSO/corn oil at 10 mg/ml as a suspension for oral administration. Enzastaurin (LY317615) : PKCβ-selective, IC50=6 nM. Go 6983 : PKCα, IC50=7 nM; PKCβ, IC50=7 nM; PKCγ, IC50=6 nM; PKCδ, IC50=10 nM. Dequalinium Chloride : Phase III for Bacterial Vaginosis. Ro 31-8220 Mesylate New : Pan-PKC inhibitor with IC50 of 5 nM, 24 nM, 14 nM, 27 nM, and 24 nM for PKC-α, PKC-βI, PKC-βII, PKC-γ, and PKC-ε, respectively, and also shows potent inhibition against MAPKAP-K1b, MSK1, GSK3β and S6K1. SD-208 is a selective TGF-βRI (ALK5) inhibitor with IC50 of 48 nM, >100-fold selectivity over TGF-βRII. LDN-214117 is a potent and selective BMP type I receptor kinase ALK2 inhibitor with IC50 of 24 nM. Staurosporine is a potent PKC inhibitor for PKCα, PKCγ and PKCη with IC50 of 2 nM, 5 nM and 4 nM, less potent to PKCδ (20 nM), PKCε (73 nM) and little active to PKCζ (1086 nM) in cell-free assays. 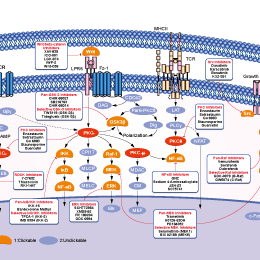 Also shows inhibitory activities on other kinases, such as PKA, PKG, S6K, CaMKII, etc. Phase 3. Go 6983 is a pan-PKC inhibitor against for PKCα, PKCβ, PKCγ and PKCδ with IC50 of 7 nM, 7 nM, 6 nM and 10 nM, respectively; less potent to PKCζ and inactive to PKCμ. 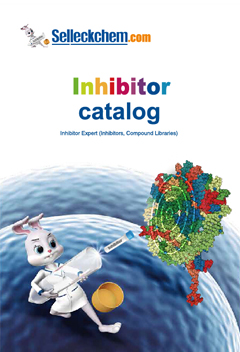 Enzastaurin (LY317615) is a potent PKCβ selective inhibitor with IC50 of 6 nM in cell-free assays, 6- to 20-fold selectivity against PKCα, PKCγ and PKCε. Phase 3. Bisindolylmaleimide I (GF109203X) is a potent PKC inhibitor with IC50 of 20 nM, 17 nM, 16 nM, and 20 nM for PKCα, PKCβI, PKCβII, and PKCγ in cell-free assays, respectively, showing more than 3000-fold selectivity for PKC as compared to EGFR, PDGFR and insulin receptor. Features:Greater selectivity than PKC inhibitor staurosporine. GF109203X is a chemical probe for studying PKC signal transduction pathways. Potential for use in a variety of cancers. Bisindolylmaleimide IX (Ro 31-8220 Mesylate) is a pan-PKC inhibitor with IC50 of 5 nM, 24 nM, 14 nM, 27 nM, and 24 nM for PKC-α, PKC-βI, PKC-βII, PKC-γ, and PKC-ε, respectively, and also shows potent inhibition against MAPKAP-K1b, MSK1, GSK3β and S6K1. Dequalinium Chloride is a PKC inhibitor with IC50 of 7-18 μM, and also a selective blocker of apamin-sensitive K+ channels with IC50 of 1.1 μM.